Spiral cut vegetables can make a tasty and fun addition to salads and work in place of grain-based pasta. If gluten or carbohydrates are a concern, try a veggie spiralizer to expand your palate and make food preparation a bit more enjoyable! 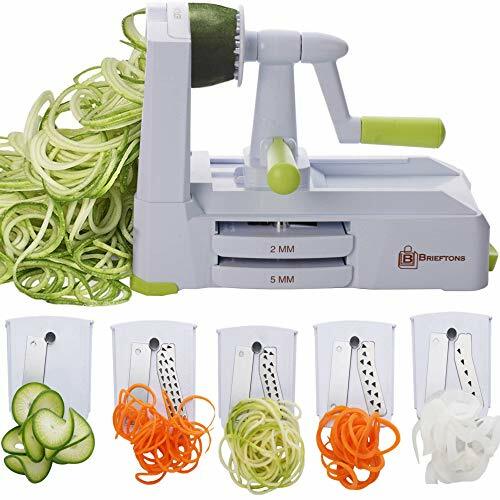 In this guide, we will look at vegetable noodle makers to make zoodles and pasta out of veggies and help you find the best spiralizer in our model comparisons and spiralizer reviews. 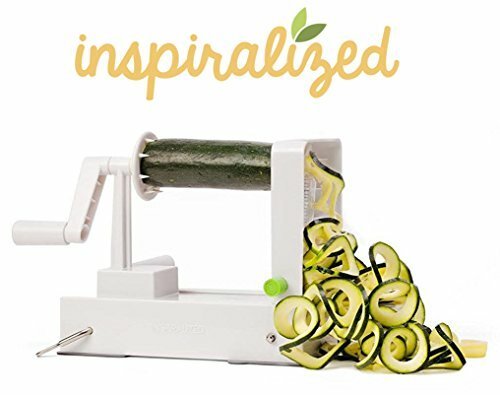 How Do I Choose A Spiralizer? The OXO Good Grips spiralizer is our favorite spiralizer overall. It has a lever-driven vacuum system to stick to the counter and removable blades for easy cleaning. 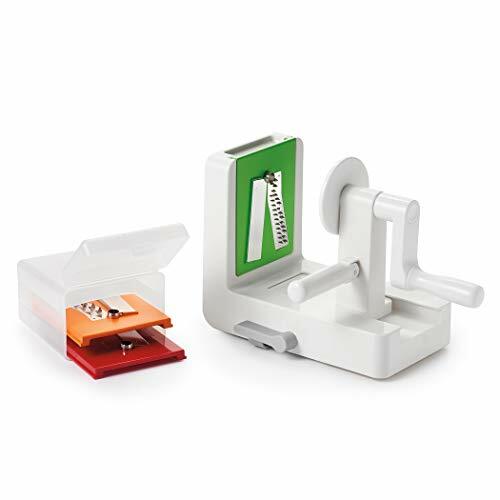 It’s sturdy and has color-coded blades to make selecting the right thickness easy. The locking suction grips mean that there’s absolutely no slide, even when working with hard vegetables like carrots or finicky vegetables like onions. While the unit doesn’t have a container to deposit sliced vegetables in, you can place whatever bowl or cutting board you want on the business end to give you as much volume as you need. Like other horizontal crank spiralizers, there’s no feeding tube, so it’s not too much trouble to put eggplant, cabbage or potatoes into this bad boy. OXO has included a case for storing extra blades, but it’s not conveniently tucked under the unit like the Paderno. You’ll have to find space in a drawer somewhere. You also have to manually change blades, unlike the Inspiralizer, but we think that the ability to remove them for cleaning more than makes up for this. Every part is dishwasher safe. We think this OXO Good Grips Spiralizer is the one to consider. The Inspiralizer and Paderno are pretty similar in terms of functionality, so they’re definitely worth considering if they’re cheaper or easier for you to get. The Paderno World Cuisine spiralizer is a horizontal, crank-driven spiralizer. It includes a straight blade for accordion cuts and blades for three thicknesses of noodles. The entire unit is compact and functions as its own storage container, making it much easier to store than most of its competitors. The Paderno attaches to your countertop with four suction cups at the corners of the unit. They don’t stick to wood too well, but they do fine on just about every other countertop surface. You’ll have to release each sucker individually when it’s time to move the unit. There is a bit of drift while the spiralizer is in use, especially when you’re using it on hard vegetables, but it’s not too bad. Spiralizers tend to be a pain to clean, but Paderno has dodged this by making its blades dishwasher safe. We recommend a quick rinse or soak after you’ve used them before throwing them in the dishwasher. You’ll loosen the bits of vegetable stuck in the little crannies and help the high-pressure water in your dishwasher do its job. If you want angel-hair vegetable strands with easy cleanup, this may be the best model for you. 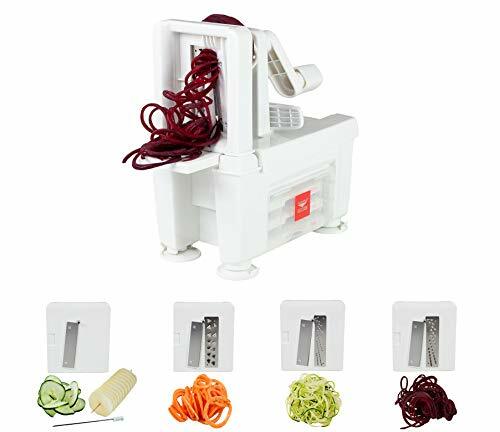 The Paderno Spiralizer Pro offers an additional blade for thinner noodles compared to the OXO Good Grips spiralizer and is easier to clean than the Inspiralizer. However, both of the other units may stick to the counter much better. The Inspiralizer offers the same vacuum clamps that the OXO does. It has four blades, giving you three thicknesses of noodles and one ribbon cut to choose from. Unlike the other crank spiralizers, the blades are permanently attached to the device. In order to change them, you simply move a lever and a different blade is brought into the cutting position. On the positive end, this allows Inspiralized to construct the unit with less blade area exposed. The Inspiralizer is much more kid-friendly on the crank end. It’s a bit scary to have kids around the other crank-driven spiralizers, where big razor-sharp cutting edges are exposed from both sides a few inches away from the crank. The drawback here is that it’s trickier to clean the Inspiralizer than units with detachable blades. You can’t just pull the blades out and throw them in the sink or dishwasher. The unit itself is remarkably well engineered, with very few places for vegetable bits to get stuck, but we think detachable blades are kind of a big deal. The Brieftons 5-Blade Spiralizer is up there as one of our favorite units. The major differentiating feature is the addition of one giant suction pad as opposed to smaller suction cups. The suction pad is operated by an on/off lever which is super easy to use and really does stay firmly in place regardless of how much force you are exerting. This is a crank operated unit with two handles, one on the side for pushing the vegetables towards the blade, and the crank at the rear. There are five blades included: four are Julienne style blades which can make 2, 3, 5, or 5.5 mm cuts, and one is a flat slicer for creating ribbons. We love the addition of a blade caddy within the machine which can hold two loose blades; the other three are stored on the body of the unit. Blades are easy to switch out with a simple release switch. Cleanup is a breeze, with all components being dishwasher safe and easy to dismantle and put back together again. The BPA-free unit is compact enough to fit in all but the tightest of storage spaces. There’s not actually much to nit-pick with the Brieftons spiralizer. It’s well made, can handle either short, round fruit like apples or super hard veggies like squash and beets. If we had to make one complaint, it would be that the blades aren’t labeled – the only way to tell them apart is to refer to the illustration in the instruction manual – but that can be easily remedied with a label maker or permanent marker. The Veggetti functions like a pencil sharpener. You push in a vaguely pencil shaped zucchini and a fixed blade slices off spiral-shaped sections. The Veggetti is one of those midnight tools as seen on TV. You can see our full Veggetti reviews here. As far as handheld spiralizers go, it’s durable, has sharp blades, and it’s about as easy to clean as they get. If you don’t have room for a crank model, this is a fine choice. Handheld spiralizers fall short of crank models in two major ways. One, they’re slow. You have to feed vegetables in by hand. Most people are much better at cranking than twisting, so the actual work goes much slower than with a crank model. Two, they only really work with soft vegetables that are shaped like zucchini. This means you can only spiralize zucchini, cucumbers, and Japanese style eggplants. If size or cost is an issue, the Veggetti is certainly a viable alternative to a larger, more expensive crank model. The functional difference between spiralizers is handheld vs countertop. Both units work by inserting the vegetable into the slicing end and twisting or cranking to produce the long slices of veggie pasta. Handheld spiralizers are easy to manage and to wash. They will take a bit more elbow grease to create the long slices of vegetables you need to make your dish. For example, the OXO handheld spiralizer is a manual spiralizer with a food gripping plate covered in small spikes. On the back of this plate is a handle for easy twisting. Depending on the size and density of your vegetable, you can handle it manually until it becomes too small to hold near the blades. It’s most effective on vegetables one and a half inches in diameter and less than six inches in length. This spiralizer is very easy to handle, wash and store. The Veggetti offers twelve different cutting blades for a variety of sizes in your vegetable cuts. All the blades are stainless steel and the tool is easy to clean. 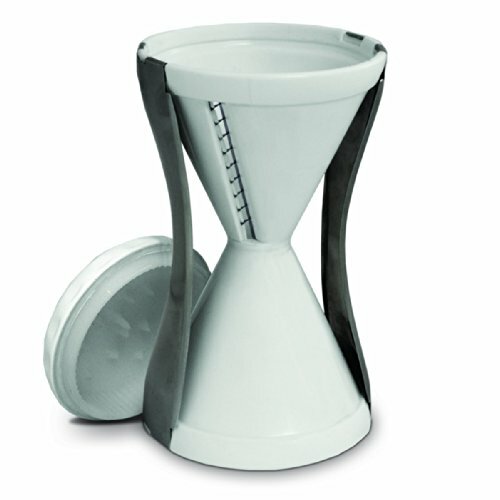 Like other handheld spiralizers, the Veggetti is easy to store and won’t need a lot of space in your cupboards. It will take more elbow grease to use than a crank spiralizer. Crank spiralizers work by clamping the vegetable between the holding plate and the blade. As you turn the crank, the vegetable is forced through the blade. The holding plates on crank spiralizers really expand your options as you build your dishes because they’re covered with spikes that will hold the vegetable against the blades with little handling. For example, messy vegetables like beets are more easily spiralized in a crank tool because you don’t need to handle them once locked in, and large potatoes are easy to slice into long ribbons because of the consistent pressure that is applied to them. The most user-friendly crank-style spiral slicer tools have a solid base with rubber feet. This means that no matter how much force you apply, your vegetable slicer will not need to be chased across the counter as you crank. You’ll want to confirm your spiralizer is BPA free. Making sure the blades are stainless steel and dishwasher safe reduces the worries of corrosion and the fuss of trying to hand wash sharp blades. There are many recipe ideas out there for paleo-friendly, gluten-free dishes. Spiral sliced produce offers plenty of surface area to add a boost of fresh flavor. Adding a spiralizer to your kitchen tools will increase your enjoyment of food from preparation to dining.